INFINI™ is a radiofrequency (RF) microneedling device that can remove wrinkles and reduce facial skin laxity. With microneedling and fractional radiofrequency waves, the INFINI™ RF device provides a non-surgical facelift that is safe for all skin types. Aging, sun exposure, environmental factors, and stress can cause the tissues of your face to dry out and sag. INFINI™ treatment can correct skin sagging and give you firmer facial skin. As a result, you will look more youthful and attractive. Fine lines and wrinkles can also occur as a result of aging and overexposure to the sun. Only one month after your treatment with INFINI™, you will see a noticeable reduction in wrinkles that will continue for up to three months. Your skin texture will also improve. Many patients who undergo INFINI™ treatment will observe major improvements in the quality of their facial skin. Your skin tone will be brighter, scars and pores will reduce in size or prominence, and oily skin types will become more balanced. INFINI™ is very effective for improving the appearance of acne scarring. 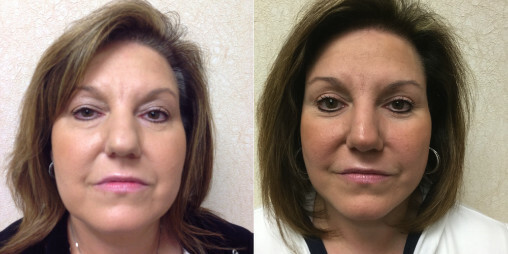 Getting a non-surgical facelift with INFINI™ will help you look more youthful. INFINI™ treatment corrects skin sagging, eliminates wrinkles, and improves skin quality so that your skin – and consequently, your face – looks healthier, younger, and more vibrant. Your confidence levels are bound to improve after treatment with INFINI™. The results of treatment rejuvenate and refresh your appearance so that you can feel confident and happy about your look. Your INFINI™ treatment will be performed in-office. Dr. Wald will customize your treatment for your needs by controlling the treatment zone, intensity, and needle pass depth. He can customize this treatment for any patient regardless of skin color or skin type. The INFINI™ device will create thousands of coagulation zones in the dermis using precise energy delivery to create micro-injuries to the skin, causing new collagen and elastin to form and repair the injured area. After the treatment, you can return home with minimal downtime. Over the next three months, your facial skin will produce more collagen and elastin and will become brighter, softer, smoother, and more youthful in appearance. You’ve Just Received Treatment With INFINI™! Now What? You can return home. Within two hours, the holes from the treatment will close up. Your face may look a little pink or be slightly bruised. You will be able to apply facial makeup 24 hours after your treatment. Within one week, you will have a brighter skin tone. If you had oily skin, it will be less prone to oiliness. You will observe improvements in fine wrinkles, skin texture, and skin elasticity. Results will continue to improve for up to three months after treatment, showing fewer wrinkles, improved skin texture, reduced acne scars, and a more youthful complexion. We're eager to inform you of all of your breast augmentation options and to answer any questions you may have. Schedule your consultation today, and start your journey toward achieving the breasts and confidence you desire!